What would a discussion of American Breads be without white bread? Possibly the most American of American bread, white bread conjures up visions of squeaky-clean, smiling nuclear families, all technicolor and perfect. This imagery may strike you as good or bad; personally, I vacillate between the two opinions a bit. While I dearly love a grainy, hearty, so-obviously-good-for-you whole wheat bread, there’s also nothing quite like a white bread sandwich filled with only mayonnaise and the thickest slice of fresh tomato you can manage. And though I tend to make grilled cheese sandwiches with whole wheat bread, it’s really only because I don’t keep white bread on hand; and you know they just aren’t quite the same. White bread, as I’m sure most of you know, is made with flour that has the nutritious bran and germ of the wheat kernel removed. This results in a bread that’s not as good for your health, but one with a finer and silkier texture. You see, the bran and germ act like sharp little things that get in the way of and interrupt the gluten structure of the wheat flour. This makes it difficult to make a 100% whole wheat bread, without adding a little white flour to help the structure along. But you don’t really have to worry about that with this bread: this bread is whiter than white, pure as the driven snow, and could give Wonder Bread a run for its money. Actually, I’d put my money on this recipe – it’s pillow-soft on the inside, but just barely crusty enough on the outside to let you know it’s homemade. The flavor is sweet and complex, far more so than you’d ever find wrapped up in a plastic bag. And that’s not even mentioning the total lack of chemicals, dough conditioners, high fructose corn evil, preservatives, and artificial everythings in this bread. Have you looked at the ingredient list for most white breads? It’s crazy what they put in there! This is a bread you can feel good about giving to a child: it may look like pure Donna Reed, but it’s got a heavy shot of Whole Foods sensibility to it. Don’t get me wrong; whole wheat bread is still the healthiest way to go, and I’m not about to give mine up. But can you really have cinnamon toast with anything but white bread? And there’s not much that can match a piece of warm white bread with melty and gooey honey and butter, is there? And sometimes, you find that perfect heirloom tomato at the farmer’s market. Juicy and plump, it’d be a crime to cook it, and you just don’t have any fresh mozzarella or basil. Sometimes, you just have to give a tomato the star treatment, on a crunchy piece of your very own toasted homemade white bread. 1. Adjust oven rack to low position and heat oven to 200ºF. Once oven reaches temperature, maintain heat 10 minutes, then turn off oven. 2. Mix flour and salt in bowl of standing mixer fitted with dough hook. Mix milk, water, butter, honey, and yeast in a liquid measuring cup. Turn machine on and slowly add liquid. When dough comes together, increase speed to medium and mix until dough is smooth and satiny, about 10 minutes, stopping machine 2 or 3 times to scrape dough from hook if necessary. Turn dough onto lightly floured work surface; knead to form smooth, round ball, about 15 seconds. 3. Place dough in a very lightly oiled container or bowl, rubbing dough around bowl to lightly coat. Cover with plastic wrap; place in warm oven until dough doubles in size, 40 to 50 minutes. 4. Gently press dough into rectangle 1 inch thick and no longer than the length of your loaf pan. With a long side facing you, roll dough firmly into cylinder, pressing with your fingers to make sure dough sticks to itself. Turn dough seam side up and pinch it closed. Place dough in greased 9x5x3-inch loaf pan and press it gently so it touches all four sides of pan. 5. Cover with plastic wrap and set aside in a warm spot until dough almost doubles in size, 20 to 30 minutes. Heat oven to 350º F and place an empty loaf pan on bottom rack. Bring 2 cups water to boil. 6. Remove plastic wrap, and place loaf pan with dough into oven. Immediately pour heated water into empty loaf pan; close oven door. Bake until instant-read thermometer inserted at an angle from short end just above pan rim into center of loaf reads 195º F, about 40 to 50 minutes. Remove bread from pan, transfer to a wire rack, and cool to room temperature. Slice and serve. 1. If, like me, you don’t have rapid-rise yeast on hand, substitute an equal amount of active dry yeast. Let the dough rise at room temperature, instead of in the warm oven, until almost double (about 2 hours for the first rise and 45 to 60 minutes for the second rise). 2. 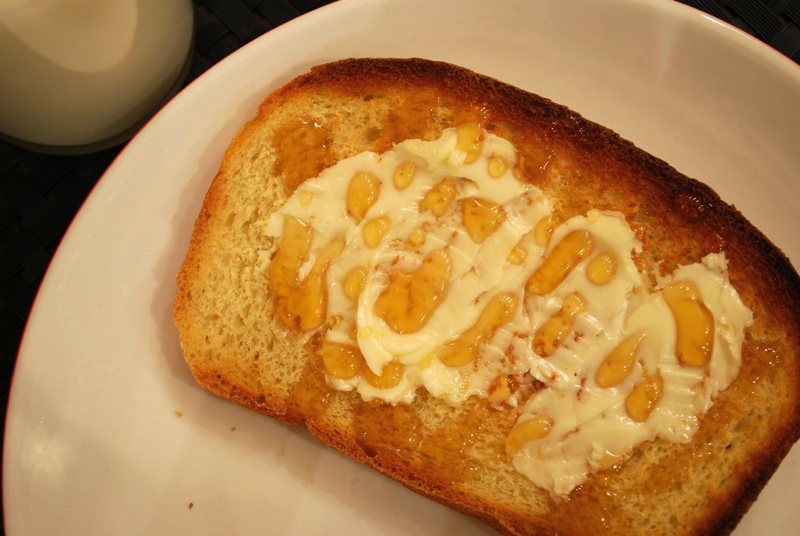 This bread will brown more easily due to the milk and honey in the dough. If it looks like it’s getting too dark, you can loosely tent the loaf with aluminum foil to prevent over-browning.